Bawdishwegu pagoda is situated on the spur of Haymawan hill in the eastern part of Linpanpyauk pagoda. The pagoda was built by king Ba Saw Phyu in AD 1470. The base of the pagoda is octagonal in shape and the pagoda looks like a truncated pagoda. There are god figures associated with the planets at the corners of the pagoda. The pagoda is 30 feet high and 106 feet in circumference. The whole pagoda was made of blocks of stone. There is a cave opening in the east to enter the pagoda. Two hundred and eighty stone sculptures were sculpted in six classes on the walls of the entrance way to the cave. The figures based on 550 Zataka stories, were carved fully in both sides of the entrance way to the cave. The figure of the king who goes around the city, clothing styles of the ministers, the clothing styles of the general and the decorations of the elephant and the horse, were carved in detail. The small Buddha images are over those figures. 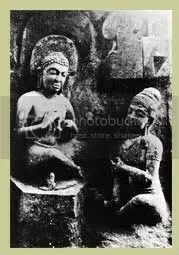 The stone Buddha image which is 6 feet high, is in the perfumed chamber inside the cave. The thone was sculpted from the single stone and it was decorated with festoons. Making the stone in the form of the lotus flower at the center of the roof of the perfumed chamber, is glorious.